Apologies for the radio silence my dear friends and customers. The last few months I’ve been quite busy, working away on some super secret projects. So there wasn’t a lot of time for blogging. BUT! Finally, I can tell you all about one of my secret projects! Gosh, it’s difficult keeping a secret! This one was especially difficult as I was very excited about it. Sam found me through a recommendation and emailed me about a quote for a bespoke engagement ring. He knew that he wanted the ring to be in white gold and a three stone design. The special feature about this engagement ring is that Sam already had two diamonds, beautiful family heirlooms from his (now) fiancé’s family. 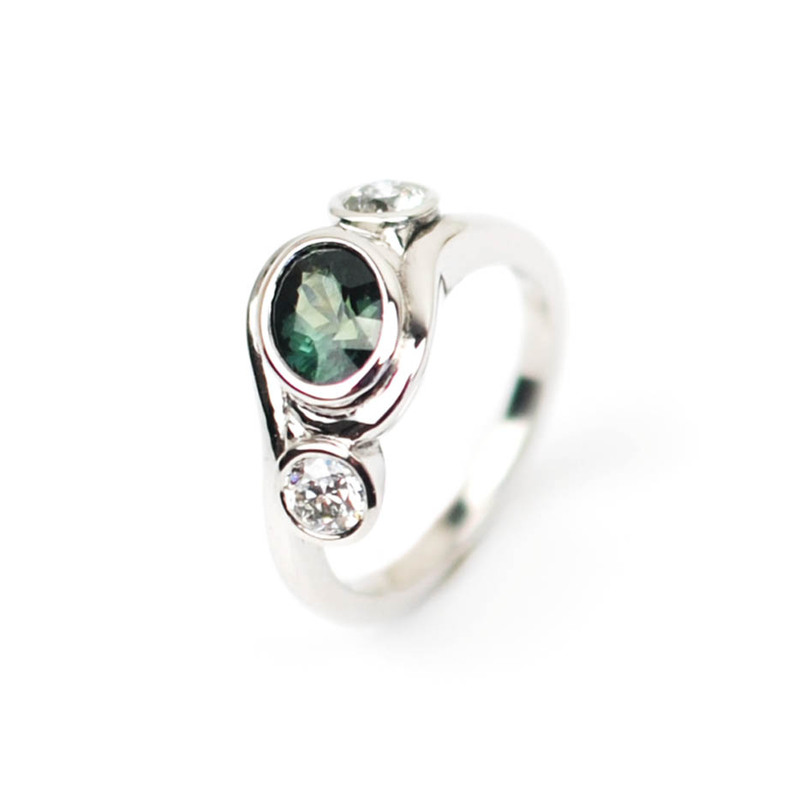 He knew he wanted to use a blue or green stone as the centre stone, as these are her favourite colours. We bounced different ideas back and forth, discussing bespoke options based on his girlfriends interests. He mentioned that she loves the seaside and waves. Inspired by this idea I started sourcing stones and drawing up sketches for Sam. Sam and I arranged a meet up so we could have a look at the stones I had sourced for him and to discuss the drawings I had made. 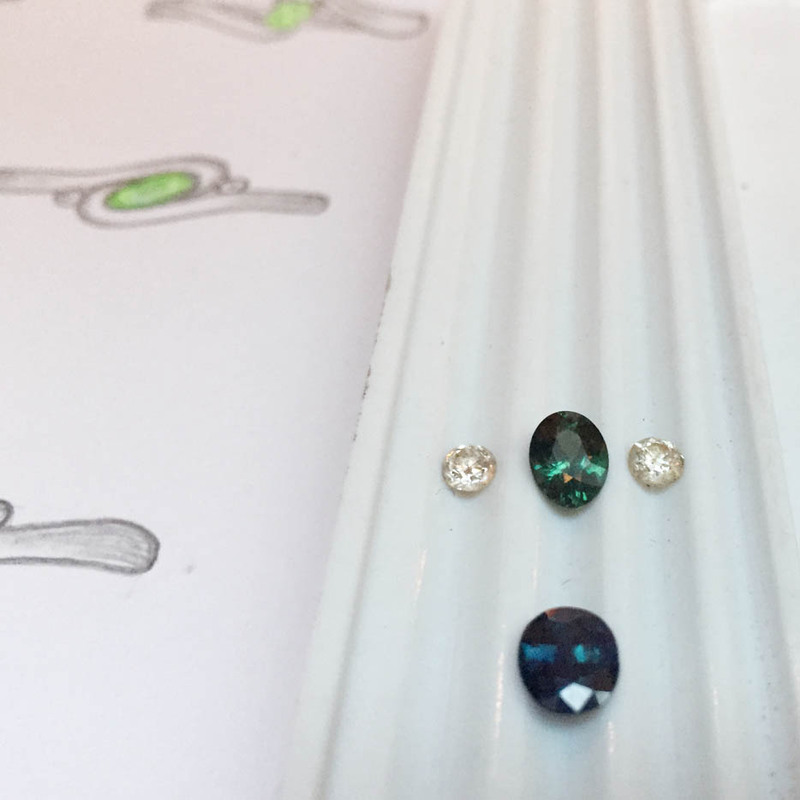 He chose a beautiful dark green sapphire that perfectly matched the family heirlooms. 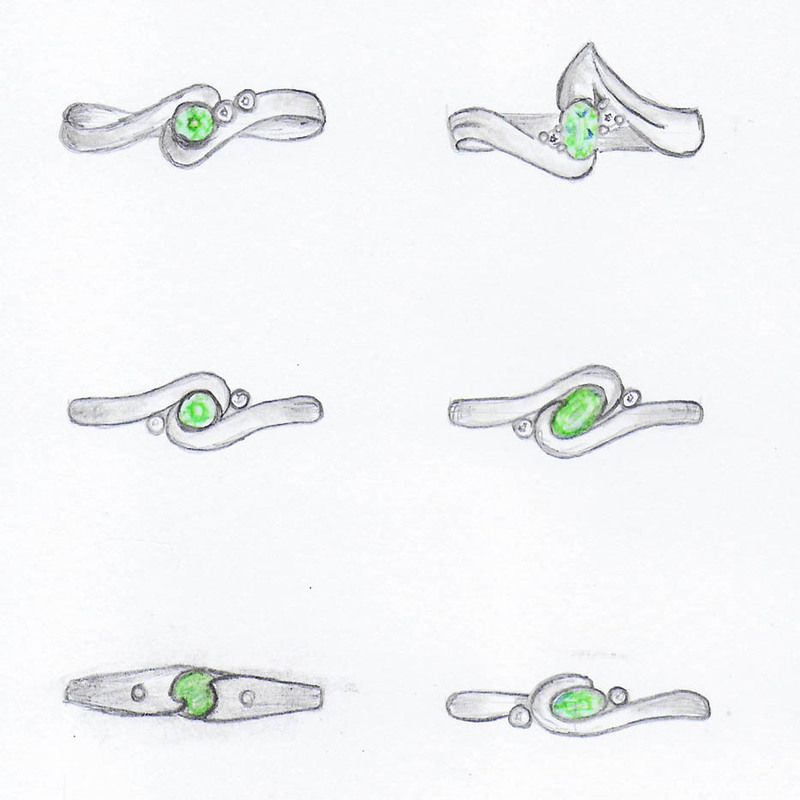 For the bespoke engagement ring design I gave him quite a few options and he liked so many of them that he couldn’t decide straight away. After consulting with the fiancé to be’s friends and family, he decided to go for a symmetrical wave ring design. Apart from the actual proposal we had passed the most difficult hurdles. 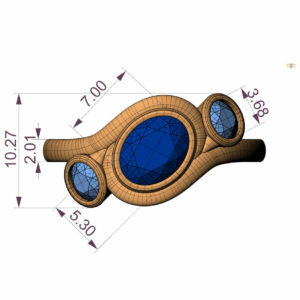 Once I knew which design Sam wanted for the engagement ring I started drawing it up in CAD. Throughout the process, I kept Sam up to date by sending him images of the piece at various stages. Sam was able to send me feedback about the design and I made tweaks according to his feedback. Once we were both happy with the ring, I sent it off for casting, hand finished and polished the engagement ring. When the ring was ready we had to arrange a ‘handover’ so to speak. Since Sam is not local to London and couldn’t go off to London on his own too many times (otherwise his girlfriend would get suspicious and we didn’t want that happening). Sam knew he was going to a concert at the end of the month, only problem, his girlfriend was going to be there too! You should have seen our e-mails, the ‘stealth mission’ was in full progress. We decided I would hide in a pub close to the venue and he would ‘pop in the pub to use the facilities’ – that’s what he told his girlfriend! We briefly met, I gave him the ring, which he loved but had to quickly hide in his jacket! 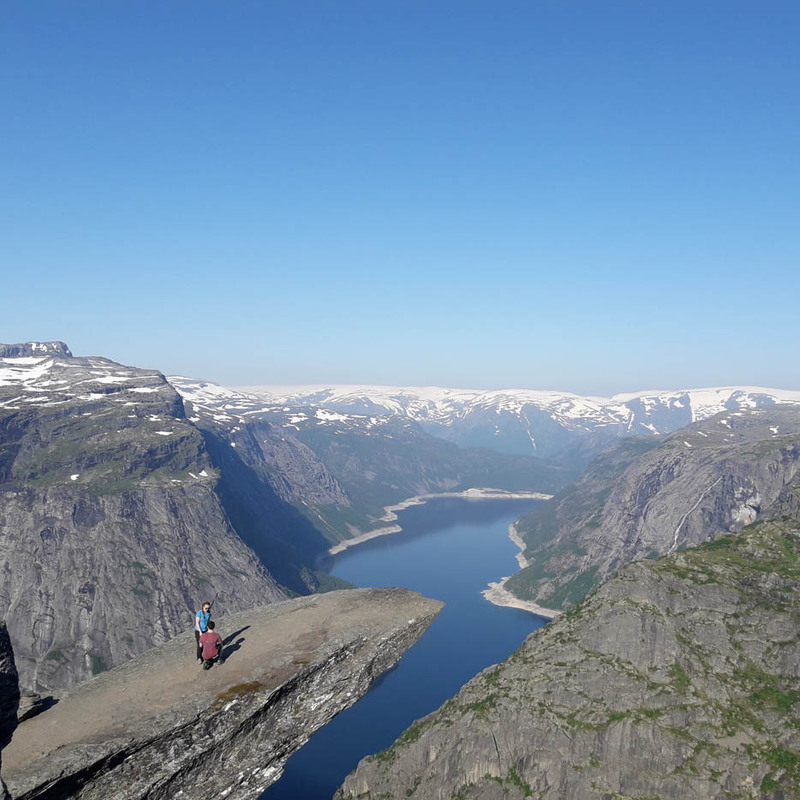 The next day they flew on holiday to Norway. He found the perfect spot to propose with an excellent view! And of course, she said YES! If you are also looking to propose to your girlfriend and would love to create the perfect engagement ring for her, then e-mail me via the form below and we can discuss your ideas. 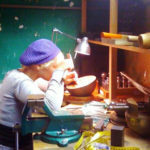 Or would you like to turn your family heirlooms into something new and special? Don’t be shy, I don’t bite, the first consultation is for free and we’ll take it from there.